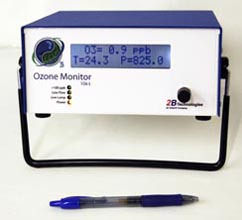 For industrial ozone applications, 2B Tech offers the Model 106-L, 106-M and 106-H Ozone Monitors, where L, M and H refer to Low (0-100 ppm), Medium (0-1000 ppm) and High (0-20 wt%) ozone concentrations, respectively. These instruments have different optical path lengths in order to accommodate this extremely wide range of ozone concentrations, spanning more than eight orders of magnitude. Additionally, the Model 106-H was designed with a flow through path that can be pressurized to up to 50 psi for in-line measurements with ozone generators. All three models are available in either a standard enclosure or NEMA enclosure. The Model 106 series was designed as an "ozone monitor on a board" in which nearly all fo the components are mounted directly to the printed circuit board. Thus, the Model 106 may be purchased without the enclosure for OEM applications. See: Model OEM-106.